Late yesterday at a meeting of the House/Senate Tax Conference Committee, House Chairman Steven Johnson (R-Assaria) proposed a complete repeal of the 2012 Brownback tax disaster, replacing it with the Kansas tax system prior to 2012. Quite frankly, this is the best thing the legislature could do. With a full repeal, the billion dollar holes created by Brownback’s failed experiment would be filled and the state would have enough revenue to begin maintaining roads and highways again, provide for public safety services, restore the social service safety net, and meet their constitutional obligation to fund education. You might remember that in the early rulings on school finance in the Gannon case, the court specifically said that the state had enough money to fund schools but that the Governor and legislature chose to give that money away in the 2012 tax cuts. Full repeal would immediately do three things that we believe are critical to any tax and revenue solution. return the more than 300,000 business owners to the tax rolls. Whatever tax plan is ultimately adopted absolutely must contain these three provisions. There simply is no other way out of the Brownback mess. This repeal proposal may come to a vote as early as this afternoon. We don’t know if this plan will pass; it is the largest tax plan proposed yet this year and it is likely that legislators will seek a compromise that preserves some portion of the individual income tax rate cuts. We believe that going forward no plan should ignore the three critical issues we listed above – at least three brackets, end the glide path to zero, and repeal the income tax exemption for business owners. Also under consideration must be the school funding plan to meet the Gannon decision. The plan passed out of committee yesterday we believe to be completely inadequate and, if adopted, would be rejected by the Court. While the State Board of Education has called for nearly $900 million in new funding, Sub for HB 2410 provides only $279 million. Structurally, the formula in Sub for HB 2410 is sound but the funding is nowhere near what is required. We are hopeful that members of the House will restore this bill to at least what it was as of last Friday – before the conservatives took over the Committee process and gutted the funding. Legislators need to keep in mind that their job right now is to restore the state to fiscal stability by passing a responsible tax plan that repeals the most damaging parts of the Brownback tax failure AND to pass a school finance formula that is both funded and constitutional. And the two cannot be considered independent of each other. A failure to pass a robust tax plan will limit the opportunity to fund schools in a way that meets constitutional muster. Yes, it did start out as “the best of times” as the House K-12 Budget Committee over weeks of work and hours of debate crafted HB 2410, a five-year plan to phase in an increase of $750 million new dollars to public schools. It was a bill with an excellent policy structure that represented real hope for starved school districts across Kansas. There was some debate about the total dollar amount – after all the State Board of Education had recommended a higher number – and there was some additional debate about whether or not a five-year phase in was too long, but nevertheless, supporters of public education saw that the Committee was on the right path. But today we saw the “Wurst of Times.” And we do mean WURST! It is said that the two things you should never watch being made are sausage and laws. Today the Committee produced a mix of bratwurst, knockwurst, andouille, and chorizo. They really did make sausage in the Committee room today. By the end of the meeting, a robust bill that had been crafted with the idea of meeting overall funding adequacy and targeting funding to the students who need the most help, turned into the adoption of an anemic bill that- in the words of one Committee member- will have them “laughed out of court.” They took the bill through a four-hour debate and a series of motions, substitute motions, and divided motions and ended up with a bill they could only vote out with no recommendation. At the start of the meeting today, the bill had five years of new funding; the first year at $179 million and each of the four succeeding years at $150 million for a total of $779 million over five years. After that, funding increases would equal the Consumer Price Index – Midwest. What ultimately passed had the $179 million for year one and an additional $100 million in year two after which CPI calculation would be used for a total of $279 million over two years. Under the bill at the start of the meeting, base aid would begin at $4,006 per pupil in the first year and increase by $200 each of the next four years ending in year five at $4,806 per pupil. The bill that came out of committee would start with $4,006 per pupil in the first year and top out at an estimated $4,342 in the fifth year. The saddest part of this sausage-fest was how the dialogue was changed. Up until today, the discussion was about our students and meeting their needs. That discussion led to the crafting of a good education policy bill and to a much more robust funding bill. Today, the consideration of student need was abandoned for a consideration of how much the politicians wanted to raise in a tax bill. Perhaps more importantly, it demonstrated that the most conservative members of the committee are still tied to Governor Brownback and his failed tax strategies. Reversing Brownback’s disastrous 2012 tax experiment would allow them to adequately fund our public education system and return stability to state services. The bill now moves to the House floor where it will be debated. We remain hopeful that a strong majority of House members are committed to seeing the Brownback mess cleaned up and our schools adequately and constitutionally funded. Remember that there are many steps remaining in this process. The bill needs to be passed by the House (hopefully after some good amendments). From there it goes to the Senate where it is subject to Committee hearings, committee amendments, and a floor debate with more amendments possible. If it comes out of the Senate in a different form from the one passed by the House, it will have to go to conference committee for those differences to be negotiated. In other words, we are far from finished. There will be opportunities to turn this “wurst” into something tasty. 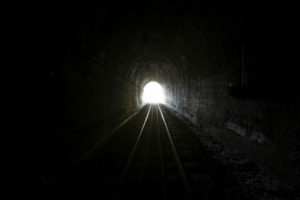 Light at the end of the tunnel, still far away. Due to a long debate on sales taxes on the House floor, the K-12 Budget Committee did not convene until about 1:30 in the afternoon today. When they did gather, they went first, back to the Scott Schwab (R-Olathe) proposal to require schools to provide for ABA therapy for any child with autism whose parents requested such therapy. Schwab brought back a new version of his amendment in which he tried to address concerns raised by committee members over the last few days. This time the requirement would only apply if there was an ABA therapist within the district borders. It also spelled out language called for by the KSDE attorney regarding conflicts with the IEP. Schwab also added a state ABA therapy fund that would be filled with $4/pupil. 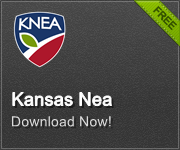 Districts could then apply to the KSDE for reimbursement from the fund. Questions were raised about the amount of money in the fund and the fact that it could easily be wiped out. The total would not nearly cover the costs to just Kansas City, Kansas schools if all their students requested the therapy. And if it was all taken quickly, the mandate and related costs would still apply to all students. Eventually, the committee adopted the Schwab amendment but only after delaying its implementation for one year. Education Committee chairman Clay Aurand (R-Belleville) agreed to hold study sessions and hearings on the issue next year with the intent of deciding whether or not to keep the mandate in place, repeal it, or adjust it. The next amendment was offered by Melissa Rooker (R-Fairway). This amendment would increase at-risk weighting in the bill from .456 to .484 and strike the provision adopted earlier to require all school districts to transfer a certain percentage of their Local Foundation Budget (what we now call LOB) to the at-risk and bilingual funds. That provision equated to a percentage which matched the percentage of at-risk students in the district. The .484 weighting is what was recommended in an LPA study of school finance. Aurand had the motion divided because he intended to support the increase in the weighting but oppose the striking of the transfer (that was his amendment in an earlier meeting). On a voice vote, the Committee approved the increase in the weighting. On a division vote, the Committee approved striking the transfer on a vote of 9 to 7. This action will add an additional $21.8 million to the bill’s total. There was some discussion of making an offsetting reduction in base aid thus keeping the $150 million per year idea intact but no such motion was made. All of this had taken us to nearly 4:00 this afternoon. There was a lot of debate! Chairman Larry Campbell (R-Olathe) called for a five-minute break but upon return from the break announced they would adjourn for now and meet again on Monday with the hope of passing out a bill. Word under the dome is that leadership would like to reduce the price tag of the bill so that they do not have to do as much in tax and revenue reform. Of course, Jeff King, the Legislature’s counsel, has told them that the more they put in for schools, the better chance they have before the Court. Additionally, plaintiff’s attorneys suggest that the $750 million over five years in the current bill is too low and the Kansas State Board of Education has suggested an amount over $850 million. We believe that the Committee and the Legislature as a whole should refuse to lower the amount and perhaps look at increasing it. Additionally, they should reverse the disastrous tax policies put in place by Brownback and his anti-government allies, raising enough new revenue to balance the budget, fund KPERS and highways, and meet the Court ruling in Gannon. The long floor debate earlier in the day was about repealing a number of sales tax exemptions in order to pay for a 1% reduction in the food sales tax. There were two tries on the floor today, the second one succeeding. While the repeal of some current exemptions (private detectives, security services, cleaning services, and a few others) goes into effect right away the food sales tax deduction won’t happen until 2020, giving future legislatures plenty of opportunity to repeal the reduction if they don’t actually solve the structural problems with our tax system today. Conservative Representative Pete DeGraaf announced on the floor today that he will be resigning his seat by the end of the month. DeGraaf revealed that he is suffering from the effects of Parkinson’s Disease and wishes to take care of his health and family at this time. Our best wishes for Rep. DeGraaf and his family as they deal with this disease and its challenges. The K-12 Budget Committee met again today hammering out a couple more amendments but not getting any closer to finished. In fact, by the end of the meeting it looked as if things my actually ratchet up tomorrow. First order of business today was to deal with Aurand’s amendment to repeal the cost of living weighting and replace it with his “Local Excellence Budget,” a 5% local property tax levy that the 140 school districts with the lowest number of at-risk children could access to provide enrichment experiences for their students. After all the discussion they’ve had about how the Court was focused on at-risk students and closing achievement gaps, it seems counterintuitive to adopt a plan to give more money to students who are not at-risk, but adopt it they did on a 9-8 vote where Chairman Campbell had to cast the tiebreaking AYE vote. They voted immediately afterwards to repeal the cost-of-living weighting. Also up for more debate was Schwab’s amendment requiring school districts to pay for ABA therapy if the parents of a child with autism asked for it. If adopted (and it has not been yet) any time a parent wanted ABA therapy for their child, the district would be required to provide it. ABA therapy is highly intensive (usually 20 to 40 hours per week of one-on-one therapy by specially trained therapists) and quite costly. A few years back the state mandated that insurance companies provide coverage for ABA therapy. The typical cost to a premium, according to Schwab, is 27 cents/month. He argued based upon that figure that the cost to school districts is minimal. But the fact is that insurance providers do not cover what is provided by the school system; so under Schwab’s amendment, a district would have to find funds from either special education (if it’s in the student’s IEP) or their general fund if it’s not. Either way, the cost would be tremendous. We also believe it is inappropriate for the legislature to mandate one specific therapy – or curriculum or teaching method or reading program – over another. The IEP process established under federal law calls for mutual agreement between parents and school officials on the best approach to meeting a child’s individual needs. Where there is disagreement, the law establishes a rigorous due-process system for parents to pursue. ABA therapy may be considered as an intervention now and if it is determined that such therapy is the best course for an individual student, it can be used. Mandating that it must the used at the request of one member of the IEP team is counter to IDEA which requires that the team consider each child’s needs on an individual basis. After much debate, Schwab withdrew his motion with the promise of bringing it back tomorrow with some adjustments. Towards the end of the meeting, it became clear that some are thinking about using tomorrow to find ways to change the funding in the bill. There was a discussion of repealing the third “boutique” weighting, ancillary school facilities weighting, and perhaps increasing the LOB cap. These discussions lead to a testy conversation in which it became clear that, despite the Chairman’s stated desire to kick the bill out of Committee tomorrow, all bets would be off if they went down the road of changing the funding. This should make for a lively and perhaps very long Committee meeting tomorrow. What one normally would expect under the dome is for the Democrats and moderate Republicans to be a coalition of nearly all issues. That was not the case yesterday in the Senate vote on HB 2067, the latest income tax bill. We will tell you that HB 2067 was an improvement over HB 2178, the earlier tax bill that the Senate passed and then failed to override the Governor’s veto but much has happened since then to change the calculus. First, HB 2178 was before the Gannon decision. The bill would have reversed much of the Brownback tax disaster and filled the budget hole but there was nothing in it for funding increases to K-12 education. HB 2067, coming after the Gannon decision, needed to not only fund the budget but also to provide for an increase to K-12 funding ($150 million in the first year, $300 million in the second and so on). A fiscal profile shared during the Senate debate found that HB 2067 would have been over $170 million short in fiscal year 2019. In other words, while the bill reversed Brownback’s disastrous experiment and funded the budget, it would not have provided for ongoing funding for schools under the Gannon decision. Sen. Jim Denning (R-Overland Park), the majority leader and de-facto leader on tax issues for Senate leadership, promised that there would be a follow-up bill to provide funding for schools. But Denning has a serious credibility problem. He told Democratic leaders he would vote to override the veto of HB 2178 if the House did and then reneged on his promise. And lately he’s been touting seriously bad ideas for school funding including tacking a $9.00/month charge onto utility bills. Democrats don’t trust that Denning will bring a school funding solution forward or that, if he does, it would be based upon fair tax policy. So the no votes on HB 2067 yesterday came from an odd couple of Democrats who want a bill big enough to reverse the Brownback failed experiment, fund the budget, and fund our K-12 education system going forward enough to satisfy the Courts and keep schools open come August and hard right conservatives who are still in full support of Brownback as the state collapses. Moderate Republicans and two Democrats voted aye, relying on a promise from Jim Denning of a separate bill for school funding that would come later. We would hope going forward that, if the solution is to be two bills, they would insist on those two bills being voted on at the same time. The fact is that Denning is just as likely to bring a trailer bill forward that is insufficient- or based on very bad ideas like the utilities tax- as he is to simply not bring anything forward at all. with increased school funding that satisfies the Gannon decision. Moreover, they won’t end the session by passing unfair or inadequate funding bills, and they want a “trust but verify” relationship with Denning and Wagle. If leadership want to run two bills, then bring both forward together, run them on the floor back to back, and vote on them at the same time. No games. No hollow promises. Action. The K-12 Budget Committee met again today continuing to work on HB 2410. They started by adopting the Communities in Schools amendment from Melissa Rooker (R-Fairway) that simply eliminates some old language that is no longer applicable to the program. Rooker then offered a motion to reconsider the amendment adopted yesterday on requiring schools to pay for ABA therapy for a child with autism if requested by the parent and supported by a medical recommendation. The Committee reviewed a letter from a KSDE attorney informing them that the requirement would violate the federal IDEA law by removing the IEP team from decision-making. The motion angered the maker of the amendment, Scott Schwab (R-Olathe), who said he was not going to act based on the opinion of one lawyer. It was Schwab who yesterday asserted that schools were sending children with autism to pet shops to pet puppies as therapy. Brenda Landwehr (R-Wichita) then weighed in declaring that our public schools were failing children with autism. When the vote was taken, it was eight to eight to reconsider. Chairman Larry Campbell (R-Olathe) cast a NAY vote breaking the tie and defeating the motion. Next was an amendment by Landwehr that would require the State Department to present an annual report on accreditation to the Legislature and Governor. The amendment was adopted. Clay Aurand (R-Belleville) returned to his amendment from yesterday on the corporate tuition tax credit program. Yesterday the amendment would have removed the requirement that private schools receiving students would have to out-perform the trend data on post-secondary success or the statewide average ACT scores. He withdrew the motion yesterday to rework it so that high schools accepting students would still have to meet those requirements but elementary schools would not. The new motion was adopted. Another Aurand amendment on the corporate tuition tax credit program changed the definition of an eligible student from one direct certified by the Department of Children and Families back to an at-risk student (defined as on free lunch). He then added that 50% of those children would have to be direct certified by DCF. The amendment passed. Jim Karleskint (R-Tonganoxie) expressed concern about language in the bill directing the SBOE to create an accreditation system based on student performance. He noted that the SBOE has just completed that work. The Revisor was directed to seek language that puts that section of the bill in the present tense and bring it back tomorrow. The final amendment offered came again from Aurand. This one would repeal the Cost of Living weighting and replace it with a Local Enhancement Budget. This LEB is intended to allow districts to raise local property taxes to get money to spend on non-at-risk students for enrichment opportunities beyond the required curriculum. Schwab asked that the motion be divided. Part A of the motion would be establishing the LEB; part B would be repealing the Cost of Living weighting. There was plenty of back and forth of this amendment raising many concerns. So many in fact that the committee ran out of time. They will meet again tomorrow with the intent of addressing the Karleskint concerns, voting on the LEB motion, and giving Schwab the chance see if he can rework the ABA amendment to address the concerns of the KSDE legal team. Campbell hopes to vote on the bill on Friday. It came as a surprise to everyone today that the Senate would take up a tax bill. House Bill 2067 was put together by the Tax Conference Committee and it was decided that it would be voted on today. HB 2067 is a match of SB 30, the tax bill that was pulled from consideration in the House when it was found that it did not have enough support to pass. HB 2067/SB 30 is a good policy bill in that it reverses the most damaging parts of the disastrous Brownback tax policy. It would restore the three income tax brackets, repeal the LLC income tax exemption, and end the glide path to zero. But unfortunately, while the bill would fill the holes in the budget, it would not provide the funds necessary to pay for HB 2410, the school finance plan crafted in the House. And one thing Legislative Counsel Jeff King told both the House K-12 Committee and all the Senate is that in order to pass Court muster, the state must show that the money is there. It is not there in HB 2067/SB30. Passage of the bill would mean that they would be forced to develop yet another tax increase to address school finance. There are no promises or plans from Senate leadership on what that “trailer bill” would be or what tax it would raise. Initially, the Senate voted the bill down on a vote of 18 – 22. They then reconsidered the action and voted to not adopt the bill, sending it back to conference where it can be used as the shell of a new tax plan. Assurances of support. Legislative leaders should commit to upholding the position of the chamber. If they are unwilling to do that for a compromise similar to Senate Bill 30, it should serve as a red flag for legislators that it may not be a compromise at all. Rather, it is more likely a maneuver to lower the bar for negotiations and push through something much smaller that fails to restore stability to the state’s budget.